Name, hometown, corps: My name is Paula Hyman. I'm 19 and I march with the Cadets. I am from South Florida (Pembroke Pines to be exact) but am currently living in New York. Why? Well I'm working for YEA! (the organization that runs the Cadets and Crossmen as well as the USSBA). It's pretty cold up here but I love it! What is your role in the corps this summer? This year I am mellophone section leader. 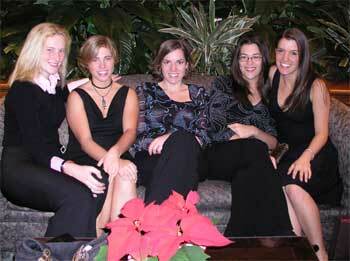 Left to right: Jessica (baritone), Laura (mellophone), Mary (baritone), Paula Hyman (mellophone) and Christen (mellophone). Give us your full marching background: I attended Charles W. Flanagan High School where I was in the Falcon Sound Marching Band. BAM. Sounds intimidating, huh? Believe me, we were. 250 members strong, we destroyed anyone who got in our way -- I'm talking this up a lot aren't I? In reality, our pants were way too big for us and the front of our jackets looked like tuxedo shirts. I think the only reason we scared people was because there were so many of us and we sounded pretty good. Visually, we were, umm -- special. Anyway, one thing I do know is that we would have crushed the Sachem Flaming Arrows from Lake Ronkonkoma, N.Y. I was high brass section leader while I was there back in the day. I was really serious about our section having pride in everything that we do. The last good book I read: "Tuesdays with Morrie." Our corps director, George Hopkins, actually had us all read this book. I'm glad he did, it's a great one that makes you realize you shouldn't take the little things in life for granted. The last great film I saw: Sorry, but I have yet to see a film better than "Dumb and Dumber." Three CD's I'd want on a deserted Island: If I were to be stranded on a desert island, I would bring a CD player that could read MP3s and then I could put a ton of songs onto those 3 CDs. The Cadets 1980-2003 would be on there, every John Mayer song ever, some Jason Mraz, definitely some Outkast, Red Hot Chili Peppers, Vanessa Carlton, Norah Jones, and, of course Jethro Tull. The rest would just be random songs. I don't limit myself to one style of music -- if I like it I'll listen to it. I'm assuming whoever drops me off on this island will supply me with unlimited batteries. My Favorite TV show: I hardly watch TV now, but I actually like the Disney channel a lot (yeah, yeah, laugh it up.). So let's go with "Boy Meets World." I like Eric. Favorite Performers: Well, other than the amazing Brian C. Angello, I'll have to say either Tower of Power, or the casts of "Mad TV" and "Saturday Night Live." How do you Blow off steam: "Hey front of the bus ..." But really -- it is very rare for me to be "mad." If I'm in a situation that is less than ideal, I usually just crack jokes about it to lighten the mood. Talking to a close friend also helps. Why I march with the corps I am in: As you probably know, the Cadets are the oldest continually operating drum and bugle corps. It's pretty amazing to be a part of and to help continue what is now 70 years of tradition. The Cadets looked like perfect little toy soldiers running around a field and I wanted to be that. Their mellophones sounded superhuman! How did they play all that stuff? I was convinced for a while that the entire corps was made up of robots because there was no way a "real" person could do any of this. I am thankful that I have the opportunity to be a part of such an amazing group of people. I've made so many incredible friends here and I don't know where I'd be right now if I didn't march. Was it always your goal to be in a leadership role? No. It's never been a conscious goal. I would just pick people out in the corps that I wanted to be like and I would mimic them. They were leading by example and I was following. I learned a lot from those guys. So now I always imagine that there is a new guy watching me to see what I'm doing, which always keeps me on my toes. I want to be a positive influence on other members just like those Cadets of the past were an influence on me. How will you go about balancing the roles of leader and corpsmate? That isn't even an issue. Being a leader doesn't make you "better" than anyone else. I'm here to do my job as a member, just like everyone else in the corps. I'm friends with everyone so if I need to ask them to do something, I ask them as a friend and they will respond as a friend. I don't go ordering people around ... where would that get me, and who would want to listen to that? Obviously the best way to lead is by example. Actions speak louder than words. You also have to realize that you are not the only person who may have ideas about things -- other people have ideas and just because you are the "leader" doesn't mean you are the only one who is allowed to express them. Communication is key -- it's always good to talk with everyone in your section and ask them how they feel about a certain thing or what they think could be done to make things better. Laura, Clif, and I discuss things we can be doing to better the section all the time. What has been your formative drum corps moment? Finals day, 2003. We warmed up in an auditorium because there was a storm outside. We played through exercises and then did some show excerpts. It was so much fun because we were on fire, playing things virtually flawless. It was such a good time ...everyone was giddy. Here comes the formative moment. Are you ready? Next we played "Cadillac of the Skies" one last time and it was the most indescribable, incredible feeling I've ever experienced. You can only understand if you were there in that room. We sounded amazing and could feel each other's emotions -- no one said a word but it was like we were speaking through our horns. As I was playing I looked at Dean, our caption head -- he had lost it and was in tears. After the big hit I had lost it as well. At the end we rippled our horns down and everyone just stopped -- all you could hear was the sound of people crying. It was a culmination of everything that happened all summer packed into one song -- all the hard work and dedication was let out. Everyone gave all that they had and it was the most beautiful thing I've ever played or experienced in my life. Best drum corps show ever? 1989 Cadets. If we are talking about a non-Cadets show, it would definitely be Phantom 1993 -- I love it. What are you most looking forward to about the summer? Texas. Oh wait, you want to know what I'm MOST looking forward to. Well, I just can't wait to get on tour. Being around my friends every day, playing crazy music while flying around a football field, the bus rides, entertaining the crowd, singing "Holy Name," putting on the uniform ... even those days in Texas when it's 110 out and the water tastes like skim milk. Nothing in everyday life can compare to the things I've experienced on tour. Every summer is priceless. Best thing about being a drum corps leader: Knowing that others will feel comfortable coming to you if they have a question or problem. That's the best thing about being a leader to me because I love doing whatever it takes to help someone. All the vets were once brand new kids and had no idea what was going on. It's important to remember what that feels like and then to help out whenever you can. Worst thing about being a drum corps leader: I don't think there is a down side. I enjoy the extra responsibility. During tour, the best part of the day is: Hmm, I'd have to say clinic days, only because we get to do two run-throughs. During tour, the worst part of the day is: "Good morning Cadets, it is 6:30 a.m." Yes, that happens sometimes. Favorite drum corps personality, and why: Michael Cesario, hands down. He sure swashes my buckle. What do you want to be when your drum corps career is over? Once I age out (in 2006) I want to continue working for YEA! during the year, but be on Cadets visual staff during the summer. I'd also like to become a consultant for high school bands as well as a show designer.